Motivation is one of the most significant factors in the process of achieving any goal in your life - and this process is anything but easy. There will be moments when you will be extremely driven and motivated. But then there will be times when you will feel down and have to deal with numerous setbacks that affect your level of motivation. In such moments, you need to pick yourself back up and motivate yourself. Make the necessary changes in your approach and move ahead in your journey to achieve your end goals. Being able to motivate yourself is the best thing you can do to ensure that you stay on the right path and continue to become better every day. 1. Only you can understand yourself the best. Only you know what you have been through and the extent of problems you have faced in your life. When you are able to remind yourself of your resilience, it becomes easier for you to move ahead and achieve all your goals despite any obstacles in your way. Also, you know how you can play to your strengths. And you are the one who can accurately figure out where you lack and what you can do to become better. When you are certain of your goals, and you are driven to achieve them, you will not stop until your goals come to fruition. You will put in the effort every day and stay focused. 2. You need to take responsibility for your life. When you are self-motivated, you realize the fact that you are in charge of your life and you need to make the effort to bring positive change in your life. You don't wait to get inspired. You don't sit around blaming others and whining about how unfair life is. Instead, you inspire yourself and make yourself work. You take full responsibility for yourself, move past the negativity and continue to work on bettering yourself. When you take complete responsibility for your life, you stop making excuses, and start making the right choices, and do everything in your control to achieve your goals. 3. When you are self-motivated, you give off positive vibes. Self-motivated people are charming. They are confident and likable. They are clear about what they want, they are disciplined and they see each day as an opportunity to improve themselves. When you are self-motivated and feel good about yourself, it shows. You become able to inspire others as well. You radiate positive energy. This allows you to attract like-minded individuals and make valuable connections as people like to be around those who exude happiness and positivity. As a result, you also improve your relationship with the people around you and feel happier. 4. You will always have yourself. You are the best source of motivation for yourself. No matter where you are or what you are doing in your life, you will always have the support of yourself. No doubt, it does feel great to be surrounded by people with whom you share some of the best moments of your life. However, out of all the relationships in your life, the one with yourself is the most important. People may leave, or your equation with them might change over a period of time, but you will always yourself. You can always count on yourself. Once you are able to motivate yourself, you can bring yourself to believe that you can overcome any obstacle that you face in your journey. Improving your relationship with yourself ensures that you will be able to sustain motivation. 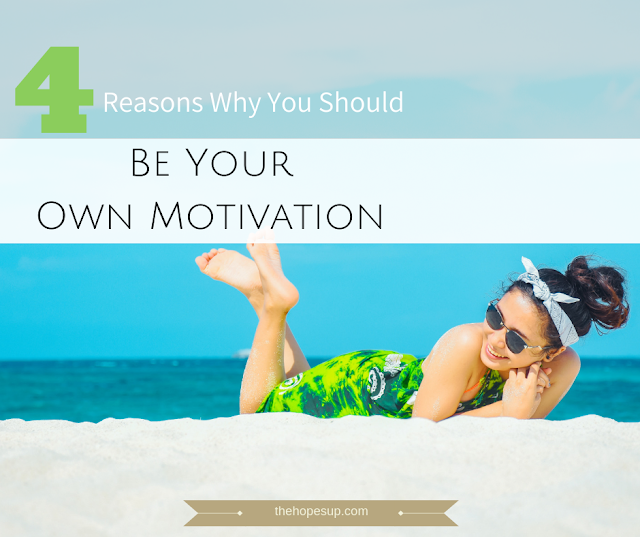 Can you think of any more reasons as to why it is advantageous to be self-motivated? if you found this post to be helpful, don't forget to share it. I love number 1! We all go through similar struggles, but our journeys are unique, and only we see and experience all of the details that are happening in our individual lives. And, number 4. It reminds me of the saying, wherever you go, there you are! 😊 I like to remind myself to always be alert and aware of what’s going on around me, because there is always something to learn, and someone to learn from. I also am trying to improve my posture, and walk with confidence. Not arrogance, but humility, I hope! And I love Hopes Up! Your comment made my day Rebecca! I'm glad you could relate to these points. And I love that quote too. It's a really simple yet powerful quote. We need to be our own cheerleaders. Also, I do think a confident body language is very helpful in feeling good about yourself which in turn can help you in staying self-motivated. Thank you so much for your love and appreciation for this blog. It means a lot! What’s The Point Of Comparing Yourself To Others?